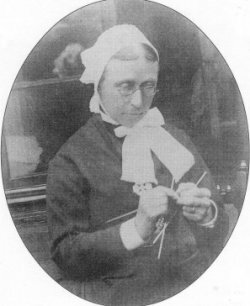 Alice HURT (1837-1894) was one of 15 children of Francis HURT (1803-1861) and Cicilia Emely, living at Alderwasley Hall. The early proceses of photography involved the use of heavy and cumbersome equipment, glass plates and large black cloths. This 20-year-old female member of an aristocratic family was probably regarded as an eccentric as she trudged around the countryside with her paraphenalia....The HURTS were in a position to provise the finance for what became one of their hobbies.... The logistics of transporting the cameras and other paraphenalia was a problem which had to be solved and Francis provided a pony and cart to alleviate this. His diaries reveal that photographic expeditions were planned affairs and the remark "...the photograph cart was sent on ahead" occurs several times. "The Hurts of Derbyshire" by Derek Wain, published by Landmark Publishing Ltd, ISBN 1-84306-042-6 is a goldmine of information and photographs about the Hurts. The publishers have very kindly given permission for some of these photos to appear on the Wirksworth website. Alice never married. Her chief hobby was photography and many examples of her work have survived. For some time she was a Nursing sister at Walsall. She died at Maidenhead in 1894. There is a reredos altar to her memory at Wirksworth Parish church.